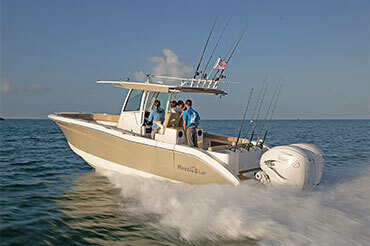 Full featured boats designed to handle the open seas! For ultimate choice for water sports and pleasure boating! Efficient use of space and loaded with features! The perfect multi-purpose family friendly boat! If fishing in skinny water is the issue but comfort and fishability features are also important the NauticBay Series is the right choice for you! Enjoy the drive and ride of a V-Hull and beach party capacity of NauticStar's Deck Boat Series with runabout styling and efficiency, the Sport Deck Series has it all. 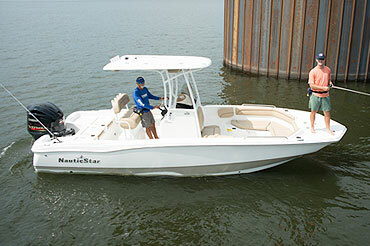 NauticStar XS Series center console offshore boat line offers unmatched quality and features for fishability and family friendly comfort from 19-28 feet! The Legacy Series is NauticStar's newest line designed for fresh or saltwater and loaded with incredible standard features as well as a wide range of options to fit your lifestyle--perfect fit for both the avid sportsman or for family recreation. They are a cross between a deck boat and a bay boat with features that both the family and the fisherman will appreciate. Plenty of creature comforts and fishability will rival any fish only boats. Add in the sport package, and you've got a pleasure boat that will deliver years of incredible family fun.